One late winter walk through the woods we came across a Maple Syrup operation. In picture postcards and old movies you see buckets hanging from metal taps and a diligent New Englander walking from tree to tree collecting buckets. 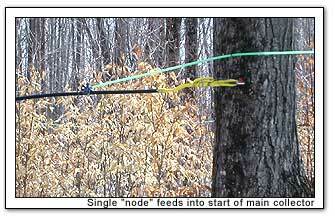 That's not a very scalable operation when you have hundreds of trees tapped. Today's modern Maple Syrup operation uses small plastic taps inserted into a freshly drilled hole just before the tree sap starts running. 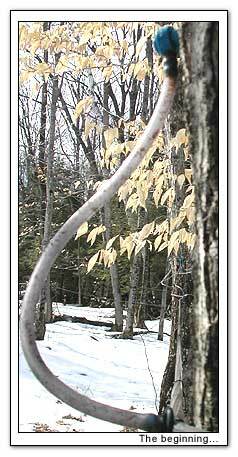 The sap starts running after a series of warm/cold days following a winter long freeze. The heating/cooling helps to get things pumping in a strong sap flow. My neighbor said that trees with lots of branches tend to put out more sap as they have more "draw." Attached to the tap is a plastic hose, which then leads to yet another hose and then another hose, all tending downhill. A small operation might congregate and feed these hoses into a fifty gallon food grade plastic barrel, with someone coming by to swap out the barrel (or most likely pump it off) every day or so. Operations covering more acreage or those lucky enough to have a sugaring house near the maple grove, feed the smaller hoses into larger main trunk hose. Kind of like a major artery. This hose runs mostly straight and downhill to an even bigger collecting container right outside the shack.